Read till the end to find out which is correct. “The Undoing Project” is the story of Daniel Kahnemann & Amos Tversky’s friendship. The two psychologists were among the most influential people of the twentieth century and have shaped the world we know today. Their studies of human behavior (some of it is told in Kahnemann’s “Thinking, Fast & Slow”) has turned many fields upside down, including Big Data, Medicine, Baseball, etc. 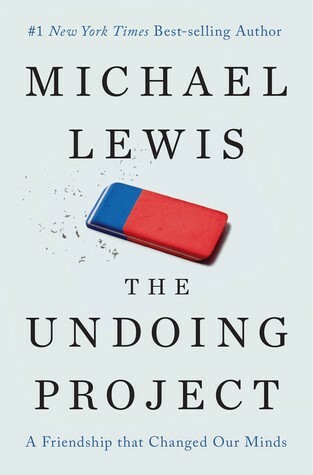 In this book, Michael Lewis (of “The Big Short” and “Moneyball” fame) explores their beginnings, the collaboration and the unraveling towards the end. Daniel Kahnemann is a non-confrontational loner with poor self confidence and an immigrant to Israel. Amos Tversky was a gregarious Israeli sabra who was universally popular and known for his genius. Both of them were atheistic precocious East European children from religious families The story of the friendship between this unlikely pairing is enthralling. Michael Lewis tells us of their childhood and how each of them was drawn to psychology for differing reasons. This book explains the various heuristics and papers written by Tversky and Kahnemann. It fascinates us with the hidden stories and thinking behind these ideas and collaboration. We get to see the origin of various heuristics like representativeness, availability and anchoring and seminal papers like ‘Prospect Theory’. The journey ends with their one sided falling out and the reasons behind it. ‘The Undoing Project’ made me care about Amos Trevsky and Daniel Kahnemann. The insightful and emotional perspectives of their lives and personalities drew me into their story.There has been an extraordinary amount of research which has gone into this book and this shows in the ‘bare-all’ narrative. Reading about the people responsible for shaking up the world through the discovery of cognitive biases, behavioral economics and ‘Thinking, Fast and Slow’ makes me appreciative the subject more. The icing on the cake is the liberal use of ‘Amosisms’. These are great thought provoking sayings from Amos, which are worth a read by themselves. ‘The Undoing Project’ is inspirational. It is a classic and deserves a place in your bookshelf. Coming back to the question on top. This was called the Linda experiment, devised by Tversky and Kahnemann. If you choose option 2, you have been subjected to ‘representativeness’ or the conjunction fallacy. Being a bank teller includes the possibility that you are also a feminist. Read the book to learn more.